We often hear about the health benefits of lentils. They have become a staple in healthy diets, and for good reason. This legume is both low in calories and highly nutritious. They’re perfect during the summer in salads and spreads, while also being a great food to cook in the winter. Vegetarians or meat-lovers alike should introduce lentils into their diets. Compared to other legumes of its type, they are easier to cook. This miniature version of a bean is high in protein and fibers, while also being affordable for just about anyone. But let’s see the facts – just what are the health benefits of lentils and how do we consume them? We’ll talk about the importance of incorporating lentils into your diet and why they are one of the most nutritious ingredients you can add to your meals. Let’s say you cook yourself a portion of lentils. A single cup of this tiny legume contains approximately 16 grams of fiber. This means that with just one meal, you can get about 63 percent of the recommended daily allowance of fiber. According to the United States Department of Agriculture, the adequate intake for dietary fiber for women is 25 grams per day and 38 grams per day for men. Most Americans do not consume the recommended amount of fiber. And it is easy to comprehend why. The standard American diet is largely based on refined flour foods that are not an ideal source of fiber. Lentils, on the other hand, are a powerhouse of dietary fiber. Foods rich in fiber can help prevent multiple diseases and conditions, some quite serious: diabetes, hypertension, heart disease, high blood cholesterol, and stroke. They can also regulate bowel movements and support the digestive system’s health. Insoluble fiber does not only prevent constipation, but it can also prevent disorders such as diverticulosis and irritable bowel syndrome. A study on dietary fiber intake published in the journal Archives of Internal Medicine shows how foods rich in fiber can help prevent heart diseases. Dietary fiber has been found to reduce the risk of death not only from cardiovascular disease but also infectious and respiratory diseases. The health benefits of lentils in regards to heart health do not lie only in their fiber count. Lentils also contain great amounts of folate (also known as Vitamin B-9) and magnesium. Folate can lower the levels of homocysteine, while magnesium improves blood flow. Just one cup of cooked lentils contains about 358 micrograms of folate. This alone will supply any individual with the daily requirement of folate. Pregnant women should eat foods containing at least 600 micrograms of folate each day. Folate lessens the risk of birth defect. Other studies have shown that a deficiency of magnesium is linked to heart attack. So take care of your heart by eating lentils and other beans as often as possible. 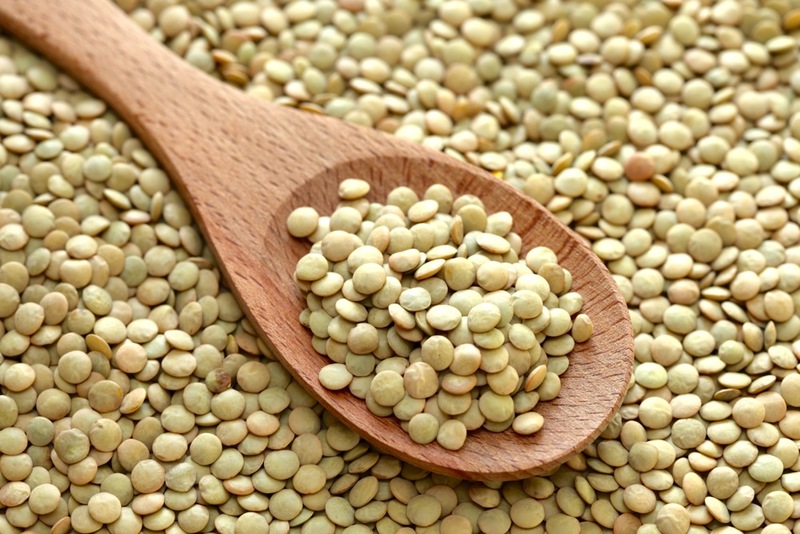 One cup of cooked lentils provides about 18 grams of protein with less than one gram of fat and no cholesterol. Compare this with other sources of fiber such as poultry, beef, and fish, and you will see how lentils might be a better option. Meats contain high amounts of saturated fats and “bad” cholesterol. This is why certain legumes are a better alternative. You can pair lentils with rice or other grain for a meal packed with all the protein you need. Lentils are also packed with iron. One cup of lentils offers about 87 percent of the recommended daily iron intake for men and 38 percent of the quantity that a woman needs. It’s especially important for menstruating women to replenish their iron stores because they are more at risk of developing an iron deficiency. Iron is an essential part of hemoglobin and of the enzyme systems that produce energy. People who suffer from iron deficiency may develop neurological problems, anemia, fatigue, and more. One of the many health benefits of lentils is its ability to stabilize blood sugar levels. People with insulin resistance, diabetes, or hypoglycemia should consume legumes like lentils to balance their blood sugar levels. Lentils contain selenium, a key mineral that prevents inflammation and can decrease tumor growth rates. It boosts the production of T-cells, thus improving the immune response to infection. Not many foods contain selenium, which is yet another reason why we’re discussing the health benefits of lentils. Lentils’ components have also been associated with a decreased chance of developing colorectal cancer. Those who are looking to lose weight will find the ideal ally in lentils. They are low in calories, contain no fat, and no cholesterol. Eating one cup of cooked lentils will bring you 230 “good” calories. And should we add they’re incredibly satiating? But do keep in mind that lentils cannot provide the 20 essential amino acids that humans need. This is why we need to eat other plant-based proteins as well. You don’t have to eat them all at once, but make sure you include foods such as beans, peas, or brown rice in your diet. To keep them as low in calories and fat as possible, the best idea would be to boil them. But most people will probably find the taste too dull. You can cook them in a low-sodium meat or vegetable stock without feeling too guilty. Adding the health benefits of lentils, it is also known that lentils contain antioxidants that offer protection from the free radicals. These harmful substances are responsible for cell damage. This mostly affects the human skin. Free radicals cause premature aging and wrinkles. Consuming lentils will not only keep your body fit and healthy, but it can also maintain healthy skin. 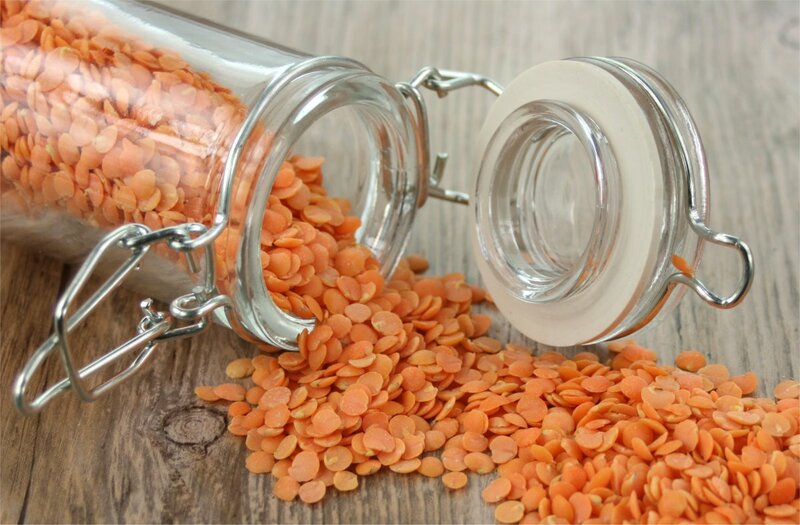 Now that we know what are some of the most important health benefits of lentils, let’s find out more about these incredible legumes. Lentils are classified by size, and they come in dozens of varieties. They grow in pods and take a round, oval, or heart shape. Their flavor varies, but all lentils share that somewhat nutty taste. Other varieties that differ from country to country. 90 percent of the recommended amount of folate. 49 percent of the recommended intake of magnesium. 37 percent of the recommended quantity of iron. 36 percent of the recommended amount of phosphorous. 22 percent of the recommended intake of thiamin. 21 percent of the recommended dose of potassium. 18 percent of the recommended amount of Vitamin B6. Given the vast number of health benefits of lentils, we should start incorporating these tiny foods into our diet without a shred of doubt. And the best news is, the process of cooking lentils is by no means time-consuming as with other foods. Unlike dried beans, for example, lentils do not need soaking. You can just rinse them, place them in a pot, and then add about two cups of water for every cup of these legumes. Once brought to a boil, reduce the heat and simmer them for about 15 to 20 minutes until they reach the desired tenderness. It’s as easy as that. Precook and keep them in the refrigerator. If a recipe requires beans, you can easily replace them with lentils. When cooking a soup or a stew, add lentils for extra nutrients. Smash the lentils and add garlic, spices, and chopped tomatoes for a quick dip. While lentils are an overall wonderful nourishment, there are some things you should be careful of. They may cause flatulence, especially when you have a sensitive stomach. When consuming lentils, make sure you drink plenty of liquids. This is a vital rule with any fiber intake. As you increase your fiber intake, increase the amount of water that you drink to prevent constipation. Fiber intake should be increased gradually over the course of one to two months to prevent digestive issues. Your body needs time to adjust to the change. Lentils are usually available both prepacked as well as in bulk. When you purchase in the bulk section, only buy lentils that have been placed in covered bins. Make sure the lentils are not moist, and that they are whole and not cracked. You should also be on the lookout for any possible insect damage. Lentils can also be found in cans. And while most vegetables lose a significant part of their nutritional value when packed this way, lentils are an exception. There is little difference between canned lentils and what results when cooking them yourself. But make sure the canned lentils do not contain additives or extra salt. Lentils should be stored in a dry, dark, and cool place. If you store the legumes properly, they can last for up to one year.